Last weekend, I landed back in the UK after a very sunny two weeks on the beautiful island of Sri Lanka. I didn't catch a tan, but I certainly caught feelings for this place. Just look at it! We managed to see three places in Sri Lanka, each as beautiful as the last; Pasikudah, Kandy and Colombo. After landing in Colombo and staying in a ~beautiful~ hotel, our driver then took us on a 9 hour drive up to Pasikudah, on the north eastern coast of Sri Lanka. psst. my bikini is from Nasty Gal! Pasikudah can only be described as paradise. Like, when people describe paradise, that's Pasikudah. The clear blue ocean, the white sandy beach, fishing boats, hammocks and palm trees, it's got everything you could possibly need for a relaxing break. We stayed at Nandawanam guest house, Pasikudah, just 15 minutes away from the beach. The rooms were basic, but the dahl was gooooood. Our family (who we met out there and travelled with the rest of the way) were staying in the Maalu Maalu resort just around the corner, which is where these pictures were taken. Because, hello, this is an Instagrammer's dream. A pool that looks out into the ocean? Fresh, delicious mango juice? Private huts with thatched roofs? You got it. Oh, and don't forget the private beach barbecue we had one evening - absolute life goals. Seriously. I absolutely loved hanging out here, it felt like an absolute dream. If you do go, I would recommend staying in one of the beach front resorts in Pasikudah if you can, as outside of these, there is not much in the town. I'd recommend staying here anywhere between three nights to a week, because if you're like me, there's only so much sunbathing you can do, even in a place like this. Just note, there is not much street lighting in the town, and not a lot of people around at night except for the wild dogs. 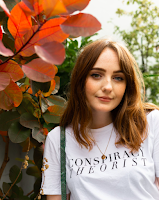 You're completely safe inside a hotel but it's not somewhere you would go for an evening stroll, and I don't even mean this in terms of crime, in fact I felt completely safe in Sri Lanka and would definitely recommend it to travellers! Our next stop was Kandy, where we spent 5 nights during the Perahera festival, which is when Kandy's tourism peaks each year. The religious festival happens each August, and takes over the entire city. Each night (and one afternoon, on the last day), a three hour parade of elephants, dancers, singers and drummers celebrate Buddha's tooth, which is housed in the Temple of the Tooth, right in the city centre. To watch the festival, you can grab a spec on the pavement (like we did, at 3pm, 5 hours before the parade starts, or like most people, at around 11am), or you can purchase a seat on a chair in a shop front or on a balcony. These can be booked well in advance or on the day, but bear in mind that prices vary and last minute seats probably don't have the best views. However, if I was to see the Perahera again, I would buy a seat, because 8 hours sitting on concrete is not good for your back, I can tell you that. Saying that, it was worth the pain. The parade was spectacular, and the chance to mix with the locals who shared their snacks and tea with us was something I'll never forget. Understandably, there are differing opinions on elephants being involved in the festival, as they are a big part of the Sri Lankan culture and a tradition in the Perahera. During the day, you can find the elephants resting in the grounds of the Temple of the Tooth, however most are chained for safety reasons. Of course this is sad to see, but if visiting Kandy during August, it is pretty much unavoidable. I managed to meet the elephants without paying their handlers any money, and my mum even got to help wash one cutie as he was preparing for the big event. The second picture down, you can see me feeding one of these beautiful creatures at nearby Millennium Elephant Foundation. A ticket inside cost 1000 rupees, and a bowl of fruit 300, totalling around £6.50. There is a vet station here for injured elephants, and volunteers help run the place. My only qualm is that the foundation also offer elephant rides, which I'm not totally on board with, but you can definitely go here and not participate in that. It's certainly not perfect, but from what I learned the staff are doing their best to rehabilitate the elephants, and it's a unique experience to get up close like never before. 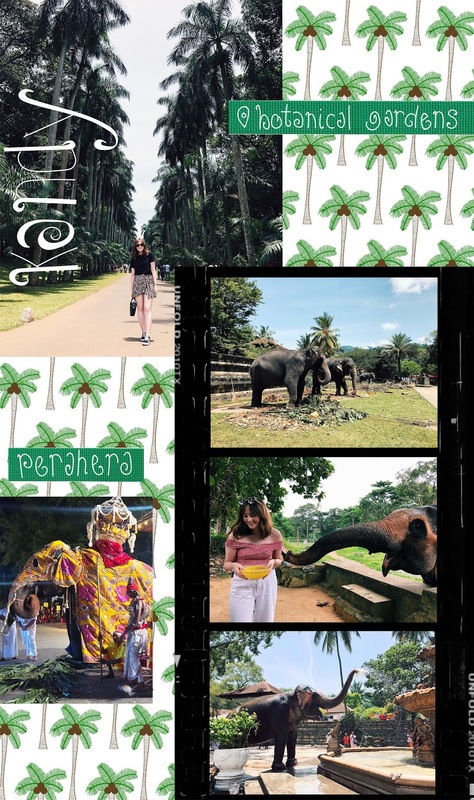 Whilst it may not be nice to see elephants wearing chains, you can certainly tell these creatures are cherished here, and are respected as an iconic piece of Sri Lankan culture. Of course, Kandy isn't all about the elephants, as I mentioned, the Temple of the Tooth is right in the city centre, and is definitely a must-see. You pay around £7.50 to get inside, but the ticket gives you access to the on-site museums, too. As you enter the temple, you follow the route to pass the resting place of Buddha's tooth, and see the mounds of lotus flower offerings. You can explore the grounds (and bump into a few elephants) and learn more about Buddhism. 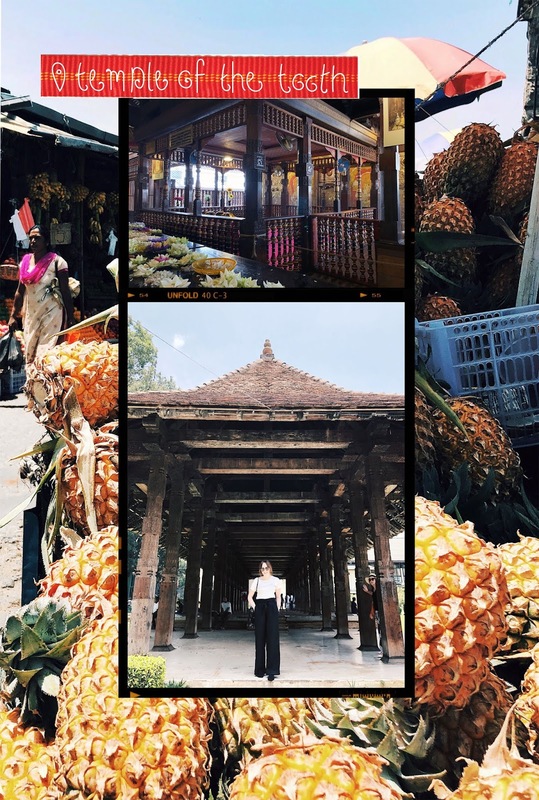 Nearby, you'll find Kandy market, which was disappointingly small, but outside was a busting fruit and veg market, which will provide you with, oh I don't know, about a month's worth of Instagram material. And I can't forget, up in the hills you can have a rooftop buffet at the Sharon Inn, where the lovely host even gave us a rendition of Hey Jude, before even knowing we were from Liverpool. My one word of advice though, is get your timings right. During the Perahera, you can so easily get stuck in the middle of the route, which takes the shape of a square, and you're stuck there until about 11pm. A lot of places close early during the festival too, so don't leave it too late to eat. For the majority of our time in Sri Lanka, we travelled by road, which is something I would definitely, definitely recommend, and something I'll go into in more detail in a future post. Just look at these moments we captured on our travels! 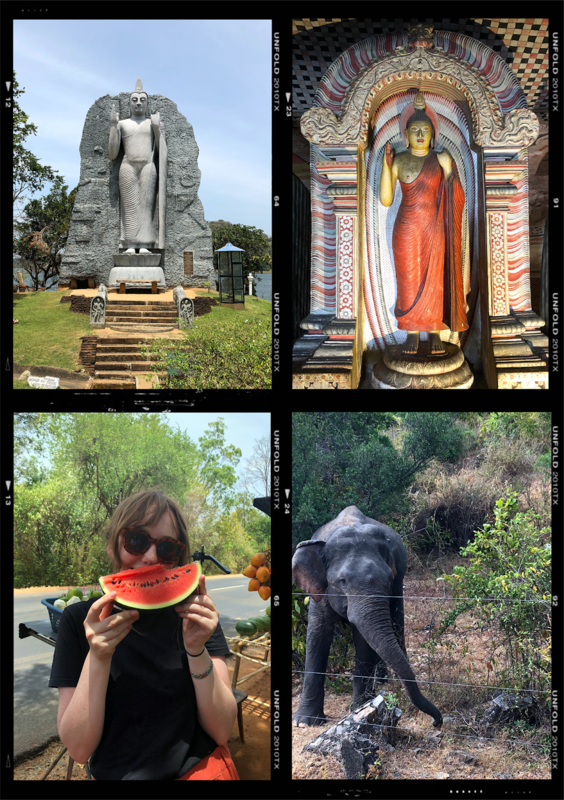 The first is a giant Buddha statue, the biggest I've ever seen, and the second Buddha is actually hidden away in the Dambulla cave temples, which is something you have to see to believe. Another thing I don't think I'll ever quite get over, is this beautiful (wild!) elephant we met at the side of the road. On our way to Pasikudah, we drove through Minneriya national park, where if you're lucky, you'll meet these beautiful creatures and some cheeky monkeys on your way. This was a pretty special moment for us, my mum even cried! If you've ever seen my mum's Etsy shop, you'll know how obsessed she is with elephants and how much this meant. Last stop - Colombo. We stayed in the capital for three nights in the most gorgeous apartments close to the city centre, but they're so good you'll have to wait for my post all about the best places to stay in Sri Lanka. Where we stayed was right by my favourite place in Colombo, Barefoot, where these photos were taken. My colleague actually told me about this place, and then my family who had already been to Sri Lanka told me I'd love it, and it turns out, they were all right. Barefoot is a shop stocking ethical cottons, handmade bags, clothes, decor and books, and has the sweetest cafe out the back. We just kept coming back here, I must have spent a fortune, but I could have spent more had I had a bigger luggage allowance.. If you go anywhere in Colombo, make it Barefoot and you'll see what I mean. Elsewhere, we visited some local shopping centres, played in an old arcade and strolled long the coast, as well as going to a family party and eating the most DELICIOUS samosas I've ever had. I still dream about them. 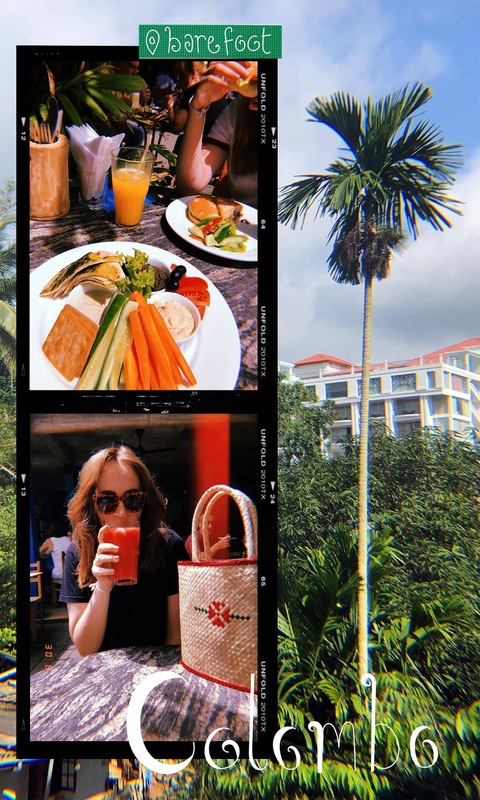 Interestingly, Colombo was the place we visited with the least Sri Lankan food options, with western and Chinese restaurants everywhere, and if you read my Shanghai tips post, you'll know how I felt about that. For this reason, and the fact Colombo felt very westernised compared to the rest of the country (obviously, it's the major capital city), it wasn't my favourite place in Sri Lanka, but I'm certainly glad I went. If you do visit Sri Lanka, just make sure you go further afield than the capital to make sure you see Sri Lanka for what it truly is. And there we go, that's my Sri Lanka travel diary for my 2018 trip. I say it like that because I will definitely be back to explore Arugam Bay and more of the island, but for now, I'll carry on writing travel blogs and spying on cheap flights to Sri Lanka. You know, just in case. Honestly I had no idea what Sri Lanka was like before I read this post, my geography is dreadful and I'd probably guess it was a dessert! Now that I've read this, it sounds like it's a stunning island with kind people, a great place to soak up the culture and sights.